There is constant conjecture from fans with absolutely no way of knowing or no insight into what the al-Hasawi family are planning who claim they all think should we fail to get promoted next year that the Kuwaitis will take their toys home and sell up. That’d be despite making a huge loss on the club. Now I’ll make no bones, a lot of people I’ve seen say this have said many times before, they are merely people who either court attention on Twitter with outlandish statements, deluded, or idiots. Occasionally it’s because they are racist. Again I make no apologies, but a lot of the anti Fawaz agenda I have seen are from those who would share the ethos of the EDL, and cannot stand a foreigner, never mind one an Islamic one owning Forest. The usual argument goes that we’d be nowhere without Fawaz, probably in league One or worse, as he has invested so much. The last season before him was one of struggle and having to sell Bamford and Morgan to fund loan moves. The club was not in a good way, and the family of Nigel Doughty sought a new buyer which was of course Fawaz. So without him that struggle, and sale of players would have continued. This is oft countered by those who point out no professional club has collapsed in years. That other clubs have been in worse peril and survived. There’s ALWAYS a buyer. And there often is. Just ask Portsmouth, just ask Chester City, just ask Leeds, There are other potential buyers, but often they are a far worse prospect that a guy who genuinely wants success but makes mistakes. Would you really prefer an asset stripper? Would you prefer plummeting to League Two and struggling against Mansfield? 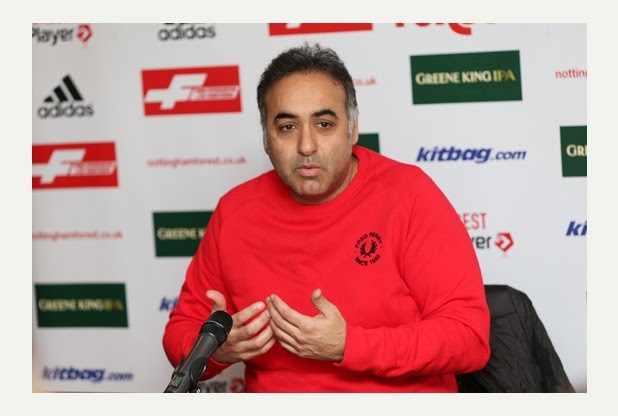 Say what you like about Fawaz and all the drama, he is no Cellino at Leeds, and he is no Mike Ashley at Newcastle. It entertains me no end those who cite there would be other buyers without any such evidence or cases to back it up. Just lose ideas they heard someone wanted to buy us. The fact remains we right now would not be a great investment. We are under embargo, and with FFP coming in it’s hard to invest in your new product if you bought us. A fan collective to buy the club would not work at this level, as the revenues to be raised would be simply far too high. As we discussed last week, we rarely sell out, say that the club should find revenue to compete and then complain if prices go up. The audience and users of this service any buyer would buy are extremely fickle. Wanting top notch products but for cheap, whilst all the time wanting complete honesty and transparency. It’s a pipe dream. Yes there have been errors, but its all part of a learning curve, as I’ve said some people go on as if Fawaz is personally trying to ruin us, which he clearly isn’t. But what he does is try to please and listen to the fans, rather than his head. Now we know his heart leads his head and if there were enough knuckle draggers on Twitter who decide to hound him out as they did with Doughty, where would that leave us? These fans forget how it would look to any potential investor that the last two guys who poured money with no returns for their cash got hounded out, then why should they bother too? It’s the same all over football, too many expect instant results and think promotion is the easiest thing to achieve. You don’t even need to invest stupid sums; there are teams out performing us on a fraction of the budget because we handed cushy contracts to players who became unmotivated because they had a secure income. That’s not the type of player we need. Now without him, we’d be stuck for his personal financial input to keep us running. Those who claim that’d bring us in within FFP forget there are long standing contracts he signed and continues to honour. Furthermore these same fans would bemoan the lack of signings as they seem to crave a constant turnover of players. Yes, there are better people to run us out there, but we don’t know who. For every wonderful prospect is awful owners and although Fawaz makes mistakes we know he has the club at heart. More than could be said for Irving Scholar and Nigel Wray, who nearly destroyed this very club. Remember those guys when you decide we need a new fall guy. There are a lot of horrific potential owners out there.